jogscotland‘s workplace programme, jogworks, has been carefully put together to help get workplace jogging groups up and running. Encouraging workplaces to be more active makes good business sense, both for employers and their employees. The pack to get you started is absolutely free! To order, contact Jo Stevens. Why introduce jogworks into your workplace? Create a positive corporate image to attract and retain high calibre employees. What kind of group would work best for your organisation? There are three different types of jogworks group. They are designed to offer something for every workplace setting, from the very smallest to the very largest, and each has its merits. An informal jogscotland group, set up using the resources in our promotional pack. These do not have trained jog leaders, but we do encourage you to ensure members join jogscotland as individual members – this can be done online. The jogscotland team will be happy to offer advice and support. A formal jogscotland group. This involves identifying suitable people to be jog leaders and sending them on a one day jog leader training course. This will give them more knowledge and expertise with which to lead the group. Link in with existing jogscotland community groups. There are hundreds of jogscotland groups around the country meeting in community centres, parks and leisure centres, and offering running sessions for a small fee. You could promote these to your employees, and/or fund or part-fund attendance. How can our workplace support a jogworks group? Pay for employee/s to take jog leader training and set up a jogworks group. Promote the jogworks group regularly to the workforce, including new employees. Allow flexible hours for those employees wishing to participate in jogworks sessions. Offer rewards and incentives for joggers eg. medals, goody bags on completion of a block of sessions. Pay entry fees for employees to enter running events. Celebrate and publicise the achievements of your jogworks members. 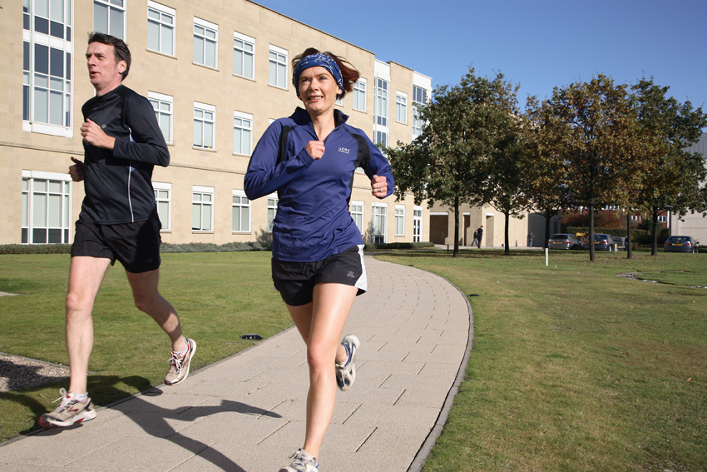 Train more jog leaders and offer more groups of differing levels. Invite people from the community to join the organisation’s jogging group. Link in with local community jogscotland groups and promote them to employees. Fund and support a community jog leader. The Healthy Working Lives scheme is designed to help workplaces improve the health and wellbeing of their employees. Setting up and supporting a jogworks group in the ways listed above can be a great way to meet some of the criteria of the awards.